Amoris Laetitia may be likened to a train that went off its tracks and therefore crashed. The Amoris Laetitia train wreck easily could have been avoided if Pope Francis had simply chosen to guard the truth handed down to him by the great Saint John Paul II, the very Pope who was canonized by Pope Francis on April 27, 2014. 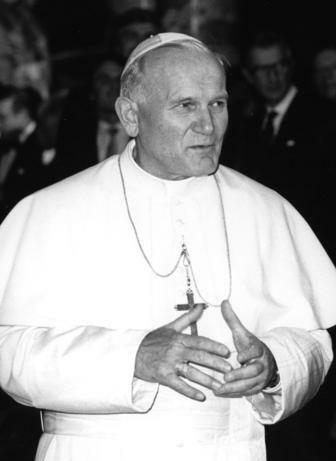 Here are the three quotes from Pope John Paul II that should have prevented Pope Francis (most especially in the controversial Chapter 8) from trying to refashion Catholic moral theology in a profoundly subjective and presumptive manner (if you are not familiar with this controversy, please refer to my previous post at the following link: https://catholicstrength.com/2017/02/19/amoris-laetitia-st-thomas-aquinas-and-the-proper-reception-of-holy-communion/). Conclusion: Pope Francis’ misstep was trusting too much in his own presumptive-leaning attitude towards God’s mercy (which casts doubt upon the clear and unchangeable teaching of the Church concerning mortal sin) rather than in the Sacred Tradition of the Church (based on Holy Scripture) which would have safeguarded the truth and avoided the scandal and confusion caused by Amoris Laetitia. There is still time to bring Amoris Laetitia (most especially the highly controversial Chapter 8) in line with the authentic teachings of the Church. Let us pray for a good ending to this difficult chapter in the Church’s history. Moreover, when a Pope goes off course it is clearly an obligation of faithful Catholics to respectfully and lovingly point it out for the greater good of the Church. Photo Attribution: The photograph of Pope John Paul II by Lothar Schaack, Nov. 15, 1980, under the Creative Commons Attribution-Share Alike 3.0 Germany license. Attribution: Bundesarchiv, B 145 Bild-F059404-0019 / Schaack, Lothar / CC-BY-SA (at Wikipedia). P.S. We see, then, that the direction of Amoris Laetitia is fundamentally at odds with Saint Pope John Paul II’s great encyclical on moral theology, Veritatis Splendor, wherein he states: “Each of us knows how important is the teaching which represents the central theme of this Encyclical and which is today being restated with the authority of the Successor of Peter. Each of us can see the seriousness of what is involved, not only for individuials but also for the whole of society, with the reaffirmation of the universality and immutability of the moral commandments, particularly those which prohibit always and without exception intrinsically evil acts” (n. 115). Amoris Laetitia and Veritatis Splendor are not in harmony with each other. It is going to be very difficult for Catholics to preach about sin if the Church creates a mitigating exception to every ongoing immoral situation; and this is the profound difficulty with Amoris Laetitia that Pope John Paul II warned about (which empties the Gospel of its saving power). JP2 – we miss you! The only way to “bring Amoris Laetitia into line with the authentic teachings of the Church” is to redact it. It is high time the Church acknowledged that she has a rogue Pope in need of correction and a blurring Papal role in need of redefinition.